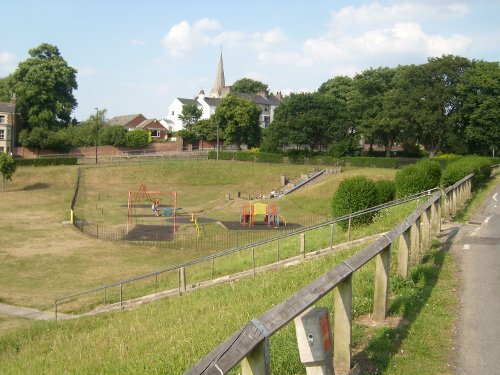 The following draft development plan is based upon the Green Flag Award judging criteria, which is the standard management plan structure for formal green spaces across York, and the rest of the country. These management and development proposals aim to bring together the needs and desire of the local community, the City of York Council Parks & Open Spaces Service, The Friends of Acomb Green and the local Ward Committees. Once agreed, we will all then have a shared vision for the Green that we can work towards. Some of the proposals will take significant investment and so should be seen as aspirations rather than firm management commitments. – Improve entrance at NW corner. – Add just 1 signs to entrances. Format yet to be decided – whether small signs or full size interpretation panels. No need for more than 1 sign. – Remove the privet ‘Daleks’ (single bushes) from bank on southern perimeter. – Replace or restore damaged bins and dog bins. Paint red dog bin green, like the others on the green. – Asses the vehicular entrance gate (half way along western edge) for suitability of hosting larger events such as the summer fair. Does it need a drop kerb or hard surface? – Continuation of the Friends group. Expand the group to include more local residents. – Improve communications between the friends, ward committees and Parks Service. With over 40% of the survey forms now returned from residents living in these areas opinions have become clearer. There is little support for changes to Green Lane (either road humps or cycle lanes) but there is a lot of backing for the provision of a Vehicle Activated Speed warning sign. We hope to progress this suggestion later in the year. In Severus Street and Howe Street residents have given their backing to the conversion of the York Road pedestrian crossing into a Toucan Crossing (which will assist cyclists to get across what is a busy road). Residents are overwhelmingly opposed to gating the rear alleys and to the introduction of a ResPark scheme. Views are mixed about introducing a 20 mph limit with several residents saying that the street is too short for it to have much effect. Over the coming 5 months, City of York Council will be delivering new kerbside recycling boxes to 66,650 homes across the city. You will receive two new boxes to go alongside your existing green box. One new box will be used for glass and the other new box will be for paper and cardboard. Your existing green box is to be used for plastic bottles and cans. In order to cut down on the problem of paper blowing across the streets on windy days that many of you have contacted me about the new boxes come will complete with lids. You will also receive a net to use on your existing recycling box. Having recycling sorted into three boxes will make collection quicker and easier for our crews and the efficiency savings this will generate will allow us to roll out kerbside recycling to those areas of the city that currently don’t have a collection. York’s recycling rate has increased from 12% in 2003 to more than 45% in 2009, saving the city millions of pounds in landfill taxes and reducing the impact on the environment. Delivery of the new boxes will be in two phases, phase one begins later this month and runs until the end of July. The second phase runs through September and October. No new boxes will be delivered during the school summer holidays to avoid any problems with people being on holiday and boxes being left out. Delivery of the boxes in Westfield is spread over both phases one and two. You will receive a letter a few weeks before your box is delivered to tell you when to expect delivery. You can also check the delivery date for your street on the City of York Council website here. The assisted service for those who have difficulty carrying their boxes to the front of the property will continue. Residents responding to our door to door survey have endorsed the idea of having a one way system in Gladstone Street and Milner Street. The proposal will now be considered by the Council on 6th July. Residents in Beaconsfield Street and School Street opted to retain 2 way working. The majority were also opposed to introducing alleygating. However residents in all streets supported the idea of having a 20 mph speed limit. The most mentioned issue concerned the new waste collection arrangements. Residents living in the Green Lane, Milner, Gladstone, School and Beaconsfield Street areas have given their views on national and local priorities. 1. Workers earning up to £10,000 will not pay any income tax (gradual introduction). 2. Increase basic state pensions from April 2011 with a guarantee that they are raised by the higher of earnings, prices or 2.5%. NB. A decision on the future of the Barbican auditorium will be made in the autumn. Negotiations with potential management companies are currently taking place. We’ve been out this week in the Green Lane area surveying resident’s views on possible changes to traffic arrangements. Resident’s have voted, by a large majority, not to have traffic calming measures installed (either speed cushions or speed tables) on Green Lane. It is likely that the sign, together with the provision of an on carrigeway advisory cycle lane, will be endorsed when the issue is decided by the Council on 6th July. Separately. residents gave the thumbs up to using the Lowfields school site (the footprint of the former buildings) for use as either elderly persons accommodation or a army cadet HQ. Many residents stressed that they wanted the green area to be retained and improved – possibly with part of it being used as a nature reserve. It is likely to be several months before any proposals are put forward for this site. The issue raised by the largest number of residents concerned poor parking near the Fish and Chip shop. It is likely that there will be more enforcement action taken in the area. New ticket machines have been fitted in the Piccadilly car park. The new system is proving to be popular with 14% of transactions already being made by either a charge or credit card. It is likely that the equipment will be rolled out to other car parks in the City. Assistant Chief Constable Tim Magwick joined local residents and Council staff at the launch of the new playground on Foxwood Lane today. The equipment is already proving to be very popular with children with an estimated 500 having already visited the playground. It is hoped that a similar facility will be provided on the Grange Lane park later in the year. Last night the list of roads to be resurfaced by City of York Council over the next year was agreed by Liberal Democrat Executive Member for Neighbourhood Services, Councillor Ann Reid. The list was boosted by an extra £1m investment in resurfacing that was agreed as part of the Liberal Democrat budget last month. The extra money was invested following the results of the public consultation which showed that the condition of roads and footpaths was the top priority for residents. It was also agreed that investigative work will take place with a view to carrying out surface water drainage improvements near the shops on Cornlands Road and on The Green (near Weatherby Road). The programme, which was also included in the Lib Dem budget, has been ongoing for the last two years and aims to make minor improvements to drainage to help cut down on flooding caused by heavy rain. Once details of when the work will take place are available I will post them here.